Rakesh Jhunjhunwala held 5.82 per cent stake in the company as of September 2018. Higher valuation seems to be a concern for the stock, which traded at a price-to-earnings ratio (P/E) of 71.50 on April 12 against its five-year average of 51.90. Ace investor Rakesh Jhunjhunwala continued to reduce his holding in watch and jewellery retailer Titan Company for the second straight quarter. Regulatory filing on Monday showed Jhunjhunwala’s stake in the company has fallen to 5.72 per cent, or 5,07,75,645 shares at the end of March, from 5.78 per cent, or 5,13,25,645 shares, at the end of December quarter. 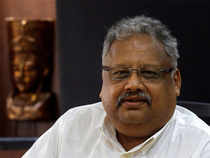 However, shareholding in the name of Rekha Rakesh Jhunjhunwala increased marginally at 1.32 per cent as of March 31 from 1.30 per cent at the end of the previous quarter. Ever since the Jhunjhunwalas first invested in the stock in 2002, the company’s market value has swelled over 300 times. The Jhunjhunwalas combined holding in the company has remained in the 7-10 per cent range all through these years. Higher valuation seems to be a concern for the stock, which traded at a price-to-earnings ratio of 71.50 on April 12 against its five-year average of 51.90. P/E is a valuation ratio that measures the current share price relative to its per-share earnings (EPS). However, most analysts are still bullish on the stock. Out of 30 analysts tracking the stock, 17 have ‘outperform’ ratings while nine others have ‘buy’ ratings, Reuters data showed. ICICdirect says Titan has consistently displayed its ability to gain market share in tough market environments. “A robust balance sheet (over 30 per cent RoCE and virtually debt-free status) and an asset-light distribution model have enabled it to outpace peers in terms of store addition,” the brokerage said. “Titan’s enriched jewellery portfolio along with the launch of new collections (wedding space) and sustained investment in brand building is enabling better-than-industry revenue growth. We model in revenue and earnings growth of 21 per cent and 27 per cent CAGR, respectively, in FY18-21E. We reiterate our ‘buy’ rating on the stock with a revised target price of Rs 1,290,” the brokerage said. Prabhudas Lilladher also has a ‘buy’ call on Titan with a price target of Rs 1,195. In a report on April 4, the brokerage said Titan has given an optimistic outlook for FY20 aiming to achieve 20 per cent revenue growth despite muted industry demand growth. This is on the back of 20 per cent sales growth in jewellery business led by higher number of wedding dates, 35 store additions, increased share of wedding jewellery as well as high value diamond jewellery and gains from consumer shift from unorganised to organised sector, it said.